DETROIT (Jan. 15, 2013) —Michelin today announced the theme for its 2014 Michelin Challenge Design™ competition; Driven/Undriven: The Duality of Tomorrow’s Automobiles. 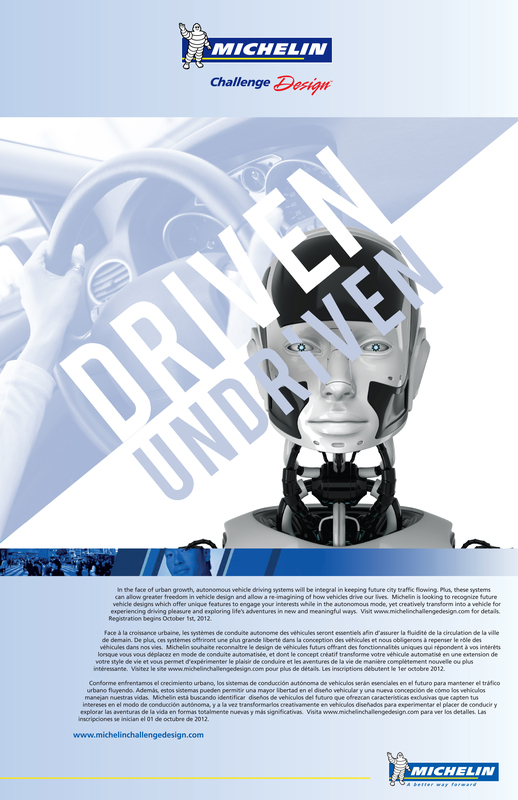 For the challenge, participants are asked to explore the human connection to a vehicle and address the potential of autonomous motoring, as it opens new possibilities in automotive design. Participants in the 2014 Michelin Challenge Design™ are encouraged to design a vehicle of the future with features and capabilities to engage drivers both in an “Undriven” autonomous mode and a “Driven” driver-controlled mode. With expected increases in populations, vehicles and traffic demands, vehicle autonomy is emerging as an essential component of future mobility systems. City planners and automotive system designers expect the car of the future will require some method of autonomous control to keep city traffic flowing. In addition, the emotional connection with one’s vehicle has traditionally been as closely tied with driving as with the sense of freedom that vehicle ownership has delivered to generations. Now, Michelin challenges designers to explore how a vehicle can be designed to operate autonomously, while also creating an emotional connection through a “driven” mode. Now in its twelfth year, the annual Michelin Challenge Design™ competition encourages aspiring designers from around the world to focus on design as it relates to a theme or an emerging trend in the automotive industry. The program is seeking exciting and passionate designs that employ innovative vehicle architecture and interactive technologies, without compromising functionality, safety or comfort. The entry process and more information can be found at www.michelinchallengedesign.com. Final submissions are due June 1, 2013. Dedicated to the improvement of sustainable mobility, Michelin designs, manufactures and sells tires for every type of vehicle, including airplanes, automobiles, bicycles, earthmovers, farm equipment, heavy-duty trucks and motorcycles. The company also publishes travel guides, hotel and restaurant guides, maps and road atlases. Headquartered in Greenville, S.C., Michelin North America (www.michelinman.com) employs more than 22,000 and operates 18 major manufacturing plants in 16 locations.